ENANTHATED 4-DHEA is a naturally occurring DHEA isomer. It’s structure closely resembles regular DHEA but the double bond in the 4th position dramatically changes its effects. ENANTHATED 4-DHEA readily converts to 4-androstenediol, rather than 5-androstenediol, boosting its anabolic potency more than 2x over regular DHEA. 4-DHEA is also expected to have a higher conversion rate to testosterone compared to regular DHEA. The 4-DHEA also lacks the calorie burning thermogenic properties, therefore offering superior calorie retention for a bulking effect.This increased anabolic potency and reduced thermogenic action will lead to noticeable gains in strength, lean tissue growth, and weight gain. ENANTHATED 4-DHEA will have mild estrogen conversion that can be easily balanced with a non-aromatizing steroid like androsterone or 1-DHEA. As with the other DHEA isomers, 4-DHEA is naturally occurring and non-toxic. Side-effects such as oily skin or reduced fertility are considered mild and temporary. The most notable side-effect would be suppression of natural testosterone production, which makes PCT necessary after a cycle. Overall ENANTHATED 4-DHEA is a very safe and effective lean muscle building agent. ENANTHATED 4-DHEA is both very anabolic and androgenic. Users will experience tremendous increases in muscle mass with quickly followed strength gains. The elevated testosterone levels will increase red blood cell count and produce what users refer to as “skin bursting pumps”. The elevated hormone levels will also increase protein synthesis, which will increase recovery times. Be sure to eat 1.5-2 grams of protein per body weight. 4-AD lacks high thermogenic abilities; therefore, it gives exceptional calorie retention for adding bulk muscle. Most users gain between 8-12lbs in a 30 days cycle of ENANTHATED 4-DHEA. These gains are kept after the cycle is over; unlike 17a methylated products that produce gains between 12-18lbs in a 3 week cycle, but only 3-4lbs are kept. This is because 17ameythl steroids inhibit 11-hydroxylase, making the cell retain water, this only appears to be muscle. ENANTHATED 4-DHEA provides quality muscle that is gained steadily and increases the health of the muscle. ENANTHATED 4-DHEA is non-methylated and therefore is not liver toxic. 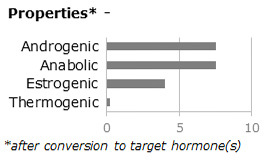 ENANTHATED 4-DHEA has a mild conversion to estrogen, which can be balanced with a non-aromatizing compound like 1-AD. Side effects include: slight acne, aggression and mild natural testosterone suppression. It is recommended to use a Post Cycle Therapy after the cycle because of the conversion to estrogen. E-Control Rx and Ultra Male Rx are recommended as a PCT to both reduce estrogen and restore natural testosterone production. Side effects are considered easily tolerated and temporary. Positive side effects include: an alpha male euphoria, increased libido, harder erections, and increased motivation. Overall 4-Andro Rx™ is very safe and provides quality mass gains.